Because you participated in a recent AuditSoftwareVideos.com presentation, as an additional bonus, you can buy ActiveData For Excel for only $200. That's a 20% discount off the regular price of $249. To order simply click on the Buy Now button below. Your discount will be automatically applied when you click on the Add To Cart button on the next page. For volume discounts or purchase orders please contact support@informationactive.com or call 613-569-4675 x 184. An attractive competitive product that firms will actually use. ActiveData adds over 100 enhancements to Microsoft Excel and delivers a comprehensive set of affordable and friendly audit analytics to the familiar Microsoft Excel environment. Click the download button to download a FREE 30 Day Trial Version. 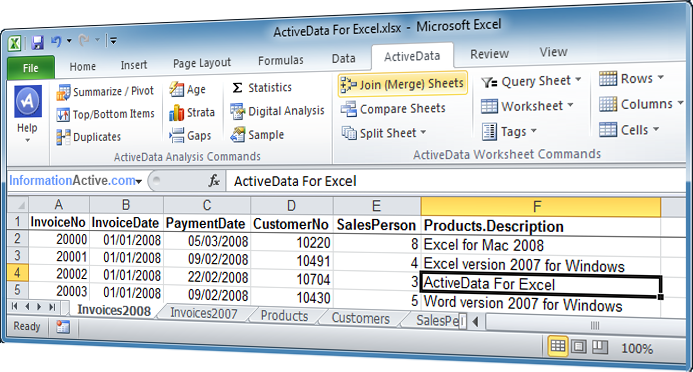 With ActiveData For Excel® you can join, merge, match, query, sample (random, stratified and monetary / PPS), summarize, categorize, stratify, look for duplicate and missing items, generate statistics, perform Benford's Law analysis, combine, split, splice, slice and dice your data like a pro! It's like having ACL or IDEA's powerful data analytics right inside Excel® for a tenth of the cost!